cjperformance wrote: Hey that Flint mobile needs a hiport 4V conversion with 6' long Munster zoomies! Dyno Don was doing 8.50's with his Hi-port 4V cc headed P/S Mustang II back then too. cjperformance wrote: And then you need the room to make pipes that will complement the hiport mod !! Yeah. It goes in a Cortina so you can't turn the pipes down, you have to go up and around and down so that it exists through the inner guard near the firewall. Kazoom wrote: no, the "3V" aussie Copy exh port must be compared to the old SVO head as the old iron 2V head exh port height is no higher than the iron 4V, the aussie "3V" copy and A3-b-c are much closer to each other. The A3 hadn't been invented, so how can it be called a hi-port if it wasn't higher than the iron heads. 3V 90mm, iron head 90mm, not much difference. It looks like SVO made an alum copy of the modified 4V, but changed the ports and made them better - an evolution, which is the same as a 3V. Looks like the SVO is a copy too. I think your picture say it all, because those ports don't look like each other at all. Get some port molding compound, and it will open up your world. Kazoom wrote: also the 4V cc Hi-port mod was done by Every American P/S racer that was serious about winning as FORD them selfs stated it was good/dynoed for a MINIMUM of 20+HP (heard some getting over 30+HP), 4V cc was the TOP DOG p/s cleveland head so mod is more than a small gain, NONE of them were waisting time or money with the inferior 2V head. 20 hp on a 900hp engine, so what should I expect on a pump gas street engine, maybe 10hp - told you it wasn't much -. 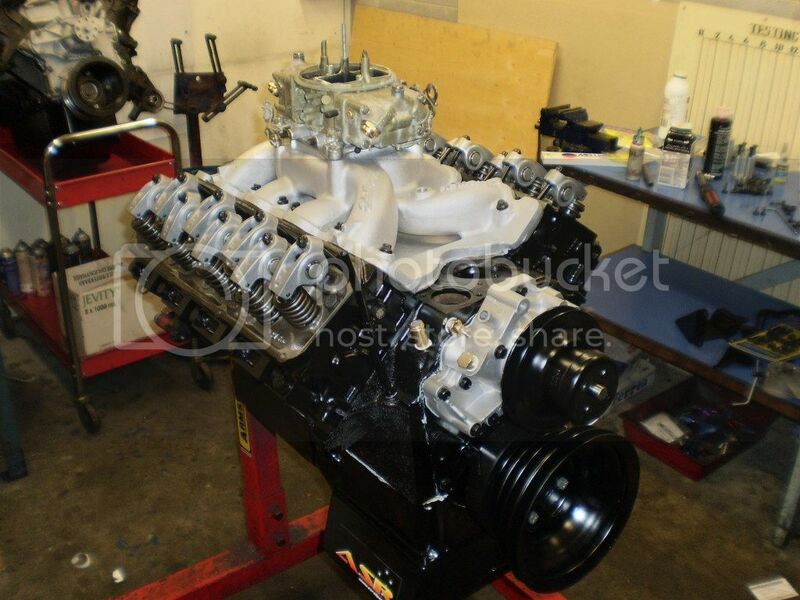 Pump gas 2V ported only, we get 585hp. If you do the development, the 2V isn't that bad and requires less mods. Kazoom wrote: the Hi-port mod may not be for every build but it is still a great mod for some guys that want to take there old iron 4V heads to the next level. The guy is a street guy, so if he did the mod it would be more for show than go, because it's a lot of work for only a small gain. RL wrote: so how can it be called a hi-port if it wasn't higher than the iron heads. 3V 90mm, iron head 90mm, not much difference. guess you better call Ford & Roush and tell them they got it all wrong . RL wrote: If you do the development, the 2V isn't that bad and requires less mods. Ford America did do/try other port development on the inferior 2V XE CC head before the 2V aussie Copy. Guess it was bad enough that they didint bother with it and gave it to you aussies lol. You do know by your criteria you have just argued that every US aftermarket head manufacturer copies. Boo on you for calling Roush a copier, because we all know now that you can't make a different head for the same application without it being labelled a copy. You have also backed me up by saying that the 3V head has a lower port, and because it can still win an EMC it kind of proves that hi-ports aren't that necessary. Gee I think you guys better lock up that Kaase for treason, because he used an known copy rather than the good old US SVO A3 copy of a 4V hi-port. 4V 601hp, 2V 585hp, doesn't sound like a dud at all, and it has no tricky mods either. Maybe you need to work harder. Any chance you have a port picture of a 2V fully ported that you can release? I always thought they were duds because all I ever saw were people do a bunch of work and end up with 230cfm intake ports. sorry RL, i been having a hard time understanding your posts, never did i call Roush a "copier" as he is one of the main Originators that came up with the 4V hi-port mod. Maybe we should move on then. Anyway I also have a question again to any old school Americans reading this that may have more info about the 69 4V head vs later 4V's as i have got diffrent answers about WHY Ford really went from a 2.25" int valve to a 2.19" int on the 4V head. 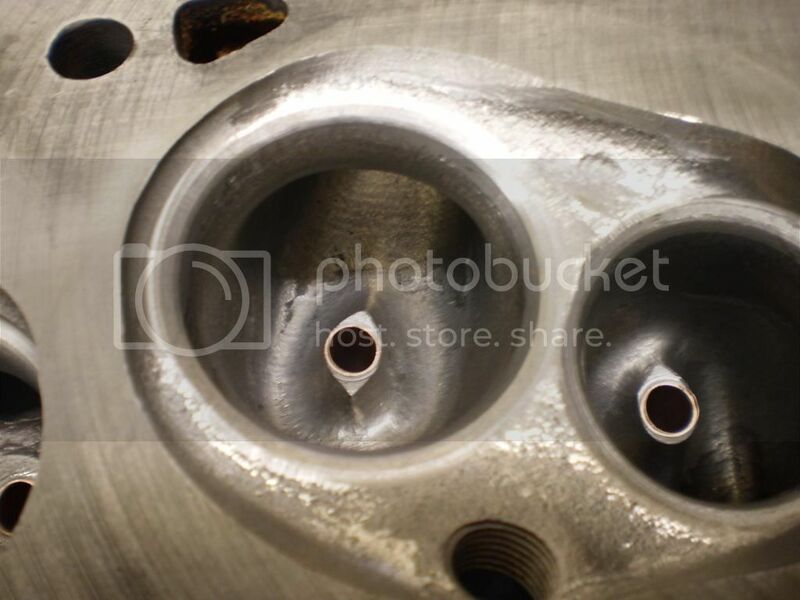 I have read that Ford did it to help with bottom end power but yet many old racers have said using the 2.25" helped with better flow/more bottom end, i remember hearing some of them even putting bigger 2.35"+ int valves by offseting the 4V heads and even guide for more low lift flow and power. 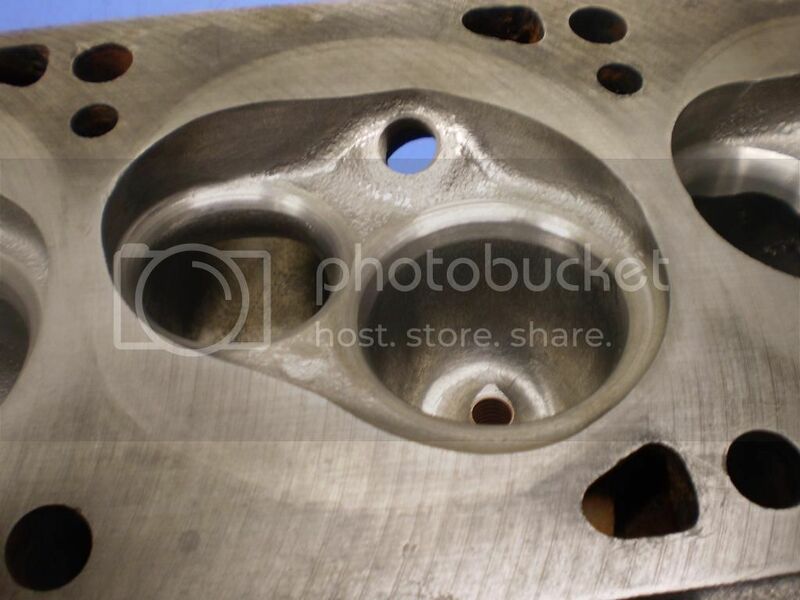 So anyone out there have any other info as to why Ford went backwards on the 4V int valve?, maybe just because of the production C block? Cool, now we will turn to some actual information. Thanks for providing that photo, because it illustrates the problem with the hi-port on a street car. The only way to get a small flow gain is to have a port that is straight and exits very high, like in the cross section drawing in the middle. 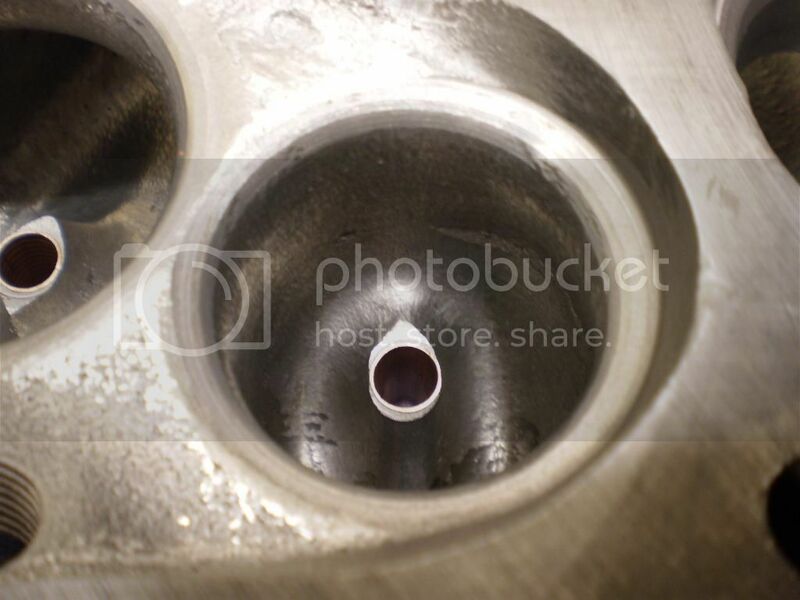 The problem is that the exhaust has to be in-line with the port to preserve the small flow gain, and that means the pipes have to go upward, turn above the rocker covers, turn down against the firewall, and then turn again to go under the car. STD flow 192cfm@0.0600" - HI-PORT 225cfm@0.600". Now imagine std exh pipes that are perpendicular to the exh plate, and that exits down like a normal street car. The exhaust starts travelling upward, but now has to make a violent turn down because of the miss matched passage. PORTED exh without the hi-port 210cfm@0.600" - HI-PORT with perpendicular exit pipes 215cfm@0.600"
The 2 heads I tested with plates that had perpendicular exits built into the plate didn't flow as good as those hi-ports. 205cfm@0.600" and 215cfm@0.600"
I could do the hi-port heads because the chassis won't let you do the normal down turned pipes because the suspension and cross member is the way, and it it's actually a competition type vehicle anyway. Make sure you can get your pipes in before you do a hi-port, because the flow will end up being equal to a straight porting if you can't, and that totally negates all the work. The trick is all in the valve size, because the correct valve size allows you to put the correct shaped SSR in to get the higher flow. 4V 2.19" valve is so big that the air has to turn under the SSR, as opposed to a 2.09" - 2.1" valve where the air has to only turn down like a in conventional port. Blow out the bowl in every direction, Blow out the runner in all directions except the floor. 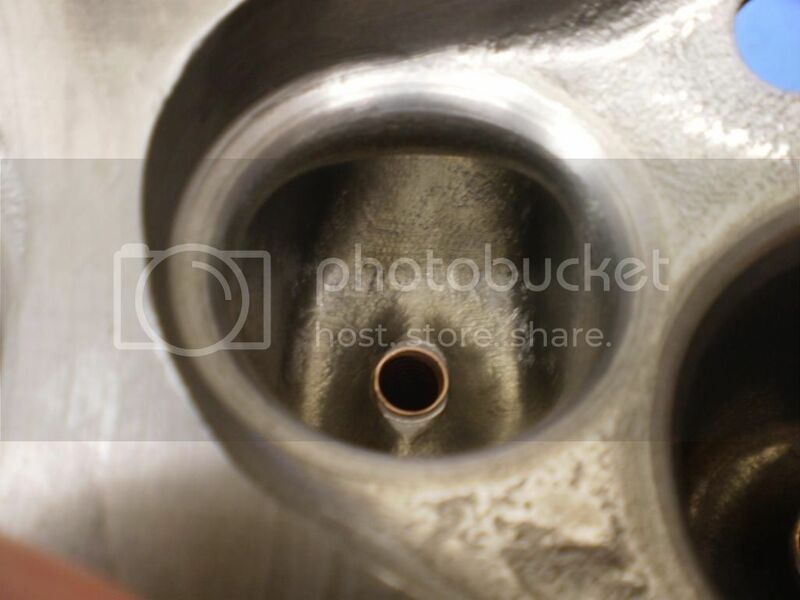 And remove the pushrod restriction on the left of the port when looking at the intake flange. 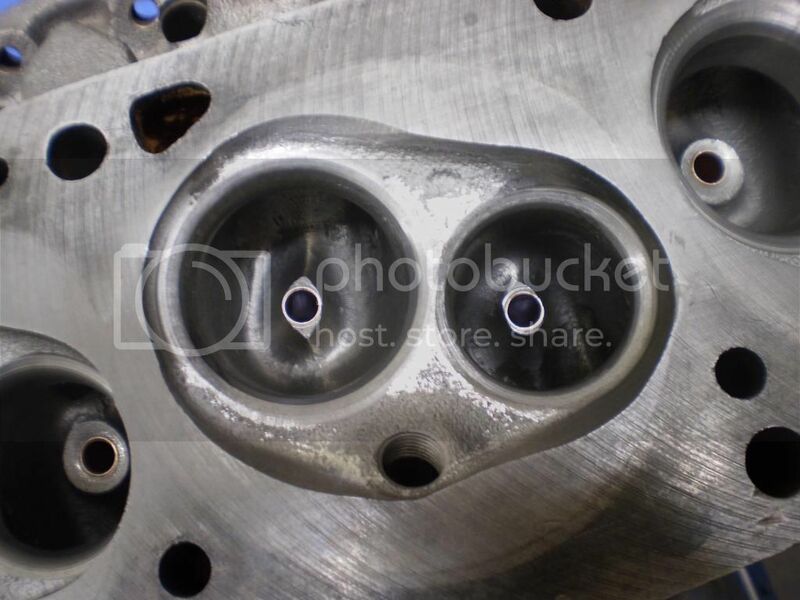 There were also 4V heads that ran the 2V valve sizes. RL, yes in the Cortina the hiports woild be great. The ports will be facing pretty much in the perfect direction for you. 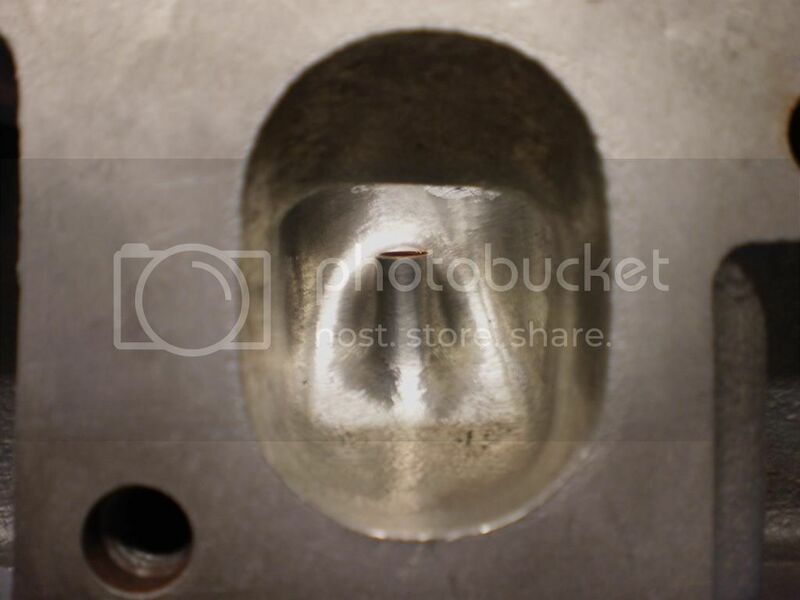 Kazoom, re the 2v type heads with the rectangle intake ports, no wonder they did not continue with them! 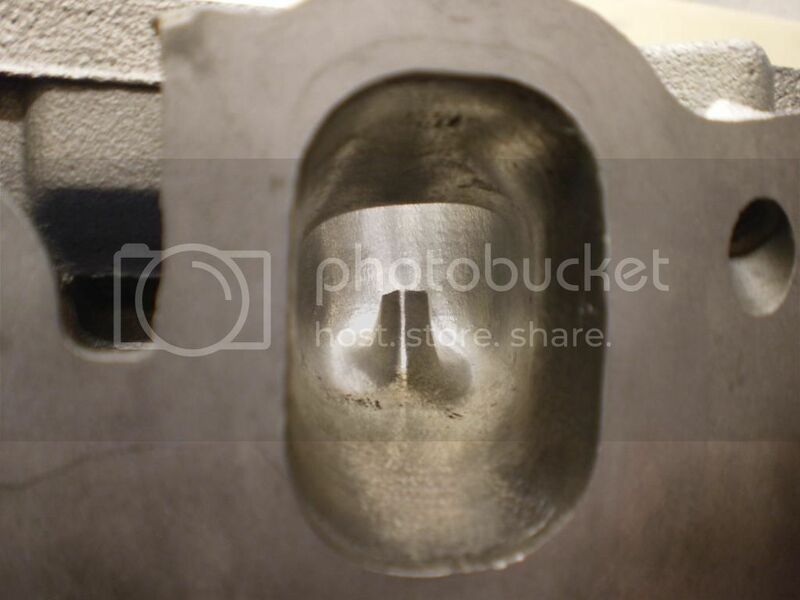 Its basically a canted valve windsor head with a 2v exhaust port and a shockingly low intake port and the same horrid short turn with the not so flash 4v type combustion chamber! Now look at the water outlet on the intake face! Those heads are aimed at producing a boss 302 with traditional windsor type intake , some better low/mid tq than the boss 302 and with an exhaust port more suitable for the cid/rpm etc. Seriously, they 'gave it to us aussies' no one here would touch that with a barge pole apart from having it on the mantlepiece as a piece for nostalgic value! cjperformance wrote: There were also 4V heads that ran the 2V valve sizes. That explains why they US gave up on the 2V - though it looked a lot worst than ours -. Flow sheet from the last set of aussie 2V's I did, they were for a street engine, 2.1 & 1.71" valves, pretty much just a pocket port with runners cleaned up & short turns done nicely, motor made just over 500hp @ 5700rpm with an rpm air gap & 830 annular on it, pump fuel, 1 3/4" tri-y headers & restrictive dual 2" system. It was a 393 cuber, cam was 244/248 on 109. Knightengines.. was that chassis or engine dyno? Chassis, made (from memory) around 400rwhp on a dyno dynamics (not in shootout mode) through a top loader & 9". 400rwhp on that dyno through a manual trans is around 500hp at the fly (run plenty of engine on engine dyno, then that chassis dyno - belongs to a long term customer).